My altered contour waistband for McCall’s 6438 is made of three pieces: the front, the back right (which extends to be an underlap) and the back left. The waistband facing has the same three pieces; but because the two back pieces are asymmetrical, they are different from the waistband pieces. After basting the skirt and skirt lining together at the waistband seam, I started pinning together the waistband pieces and the waistband facing pieces and made my frustrating discovery. See these pattern pieces that look ready to go? Deceiving! I interfaced the facing pieces, not the waistband pieces. Gaaah! The front piece is symmetrical, so the waistband and facing are interchangeable, but the back pieces are screwed up. Use as is and have the underlap extend from the left under the right piece. Then the skirt waistband would open the opposite way. If I ever wore it with a back-button blouse with a correct overlap, it would look stupid. 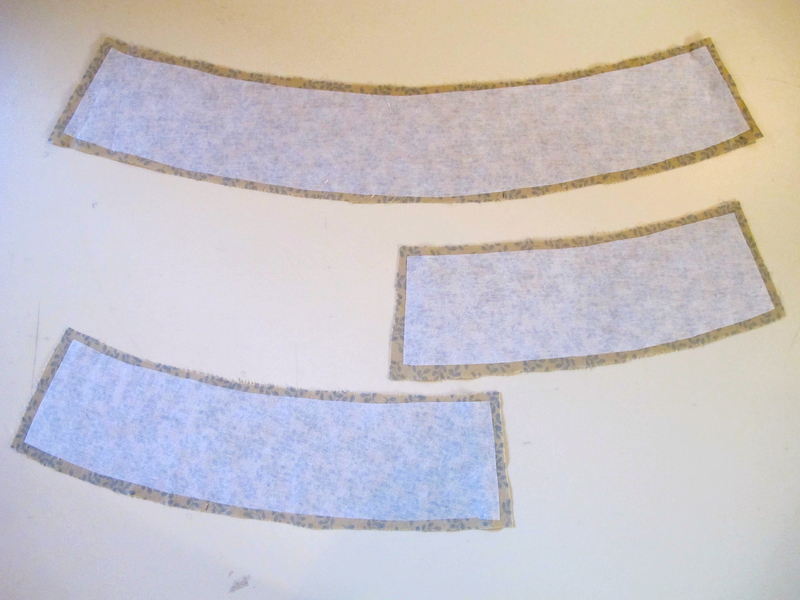 Use the interfaced pieces as the facing and the noninterfaced pieces as the waistband. But then I’m afraid the hand sewing of the facing wouldn’t come out as well and seam allowance ridges would be more obvious at the front of the waistband. Interface the back waistband pieces and cut new back facings. But that is a waste of resources since it’s not absolutely necessary. I’m glad I made this mistake on the wearable muslin, so I can be aware of this issue when working on the good fabric. The question is: Which one of these solutions do I dislike the least? Use the interfaced front piece for the waistband. Attach it to the non-interfaced back pieces. For the facing, I can use the noninterfaced front piece attached to the interfaced back pieces. It solves most of my issues without using additional fabric or interfacing resources. I definitely dislike this solution the least. It only took me two days to come up with it. Gemini note (because sewing isn’t everything): After being on vacation and eating nothing but pricey and oversized restaurant food for a week, I just want to cook and bake every day!